Hybrid gas detector and toxic gas detector are two devices common to see in the modern instrument industry, and usually compared with each other. In the following part, let us take a look at differences between these two devices. Hybrid gas detector: The hybrid gas detector is applicable to detection of multiple mixed gases under various industrial environments and special environments. The device adopts the imported electrochemical/infrared gas sensor and microcontroller technology. Fast in response, high in stability and good in repeatability, the composite gas detector demonstrates outstanding performance as an intrinsically-safe device in China to continuously measure gas concentration. Internally, a large volume of ni-mh rechargeable cells are adopted to ensure a super-long standby. The plastering packaging is reliable and aesthetic. The digital LCD backlight screen can clearly and directly demonstrate the results. The second-level sound-light alarm is equipped to ensure timeliness, accurateness and direct alarm of the concentration level. The instrument appearance adopts the specially-made, high-intensity ABS engineering plastics. With a fashionable, aesthetic appearance design, the composite gas detector offers a good hand feel and is endurable. 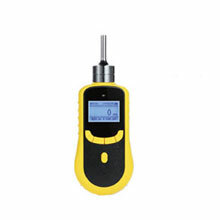 The composite gas detector can be equipped with multiple gas detection sensors. Therefore, it has a small volume, light weight, fast response, and multi-gas concentration display. Compared with ordinary gas detectors, it is convenient to use, and is applicable to detecting multiple gases, including the methane, ethane, dimethyl-methane, butane, alcohol, formaldehyde, CO, CO2, ethylene, acetylene, chloroethylene, styrene, and acrylic acid. Toxic gas alarm: The toxic gas alarm can be used to detect toxic gases in the atmosphere, and the detection results are represented by ppm (parts per million). The oxygen is indicated by profits and losses (% VOL). The industrial and highly-reliable electrochemical or infrared sensor can be adopted to ensure a high stability, eliminate the need of maintenance, and reflect the high-tech development level. The toxic gas alarm has three pre-set alarm points, which can be modified via programs and are corresponding to three LED indicator lights. In the process of industrial production, all kinds of toxic gases might generate, which, if not properly disposed of, will cause poisoning. Especially, the inflammable toxic gases like CO, if being mixed with other gases to achieve certain level of mixed concentration, will explode in contact with sparks. Though existence of toxic gases is unavoidable, we can take measures to prevent them. As long as we can immediately discover the existence and concentration of toxic gases and take corresponding measures, we can try to avoid occurrence of potential dangers, and reduce the losses to the largest extent.